Palak pakora is a delicious tea time snack. 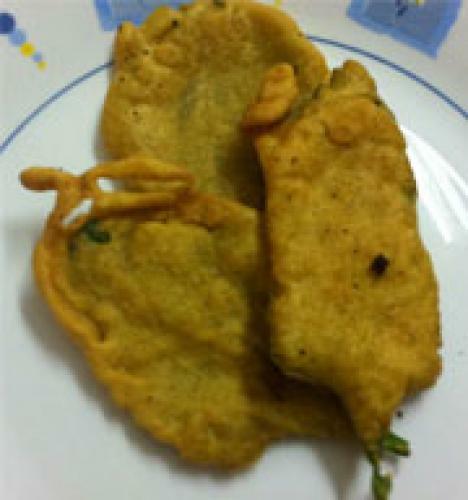 the taste of deep fried palak ke pakore becomes more yummy when eaten with green chutney. these spinach pakoras can easily be served as a party snack. wash the palak leaves. drain the water and then cut the stems. separate each leave and let them dry. choose the spinach bunch which has broad and big leaves. in a bowl, add besan, red chili powder, garlic, green chilies, rice flour, baking soda, carom seeds and salt. adding little by little slowly make a batter of this mixture. the batter should be thick enough to coat the leaves evenly. keep the mixture aside for 2 - 3 mins and then again beat it for 30 secs. this will make the pakoras very crisp. heat oil in a frying pan. when hot enough take each leaf, coat it with the batter and then slowly drop it in the frying pan. you can fry 2 -3 pakodas at a time depending upon the size. fry them on medium flame otherwise they will get burnt. note: 1.to check if the oil is hot, put a small drop of batter if it comes up immediately the oil is hot enough. 2. do not throw the pakoras in the hot oil or else you will burn your skin. fry till the pakoras become crisp and golden brown on both sides. it will take 3-5 minutes if you fry on medium flame. strain them and keep the fried palak pakoras on paper towels. serve hot with green chutney or ketchup .